Compared with the rest of Africa the Zambian economy has enjoyed much more stable economic growth and was less affected by the global financial and economic crises of 2007–08. Since 2009, economic growth in Zambia has averaged over 6% per annum and inflation has fallen from around 10% to 6.5% in 2013. The tripling of global copper prices from 2009 to 2011 had a significant impact on production in the mining sector. Zambia has gone some way in reducing its dependence on private and public sector consumption towards a greater reliance on private sector investment. However, the growth rate of private sector investment fell after 2010. In comparison, the growth of public sector investment has increased since 2010. 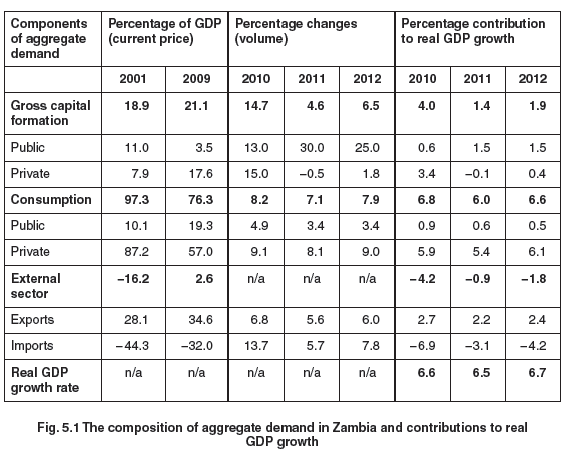 The composition of aggregate demand and the contribution made to GDP growth by consumption, investment and net trade in Zambia is shown in Fig. 5.1. 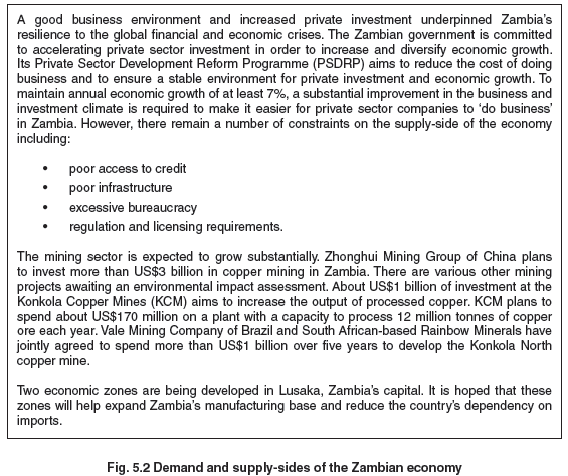 An assessment of the key structural issues facing the Zambian economy is shown in Fig. 5.2. This highlights the aspects on which government economic policies need to be focused in order to promote long run economic growth in Zambia. Independent since 1964, Zambia has experienced five successful multiparty elections since the return to multiparty politics in 1991. The latest elections in September 2011, were peaceful, and further strengthened Zambia’s democratic credentials. Zambia has British–style parliamentary democracy. Government consists of the President and the 158-seat national assembly. Elections are held every five years and the presidency is limited to two, five year terms. There are also traditional chiefs and their headmen, who still command a great deal of respect but hold little decision-making power except when it comes to land distribution. However, Zambia’s economic growth has not translated into significant poverty reduction. Sixty percent of the population lives below the poverty line and 42% are considered to be in extreme poverty. Moreover, the absolute number of poor has increased from about six million in 1991 to 7.9 million in 2010, primarily due to population growth. The urban picture is far better than the rural: in the Copperbelt and Lusaka provinces, for example, poverty incidence is fairly low (22% and 34% respectively), whereas in the rest of the country, which is dominated by agriculture, poverty rates are greater than 70%.